In this tutorial we'll start from the very beginning and create the Data Access Layer (DAL), using typed DataSets, to access the information in a database. For these tutorials we'll be using a Microsoft SQL Server 2005 Express Edition version of the Northwind database placed in the App_Data directory. In addition to the database file, the App_Data folder also contains the SQL scripts for creating the database, in case you want to use a different database version. These scripts can be also be downloaded directly from Microsoft, if you'd prefer. 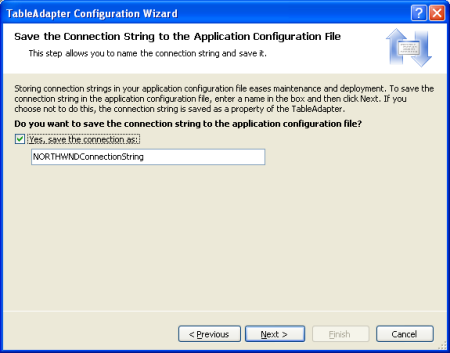 If you use a different SQL Server version of the Northwind database, you will need to update the NORTHWNDConnectionString setting in the application's Web.config file. 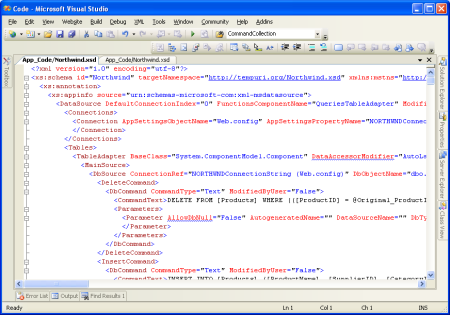 The web application was built using Visual Studio 2005 Professional Edition as a file system-based Web site project. 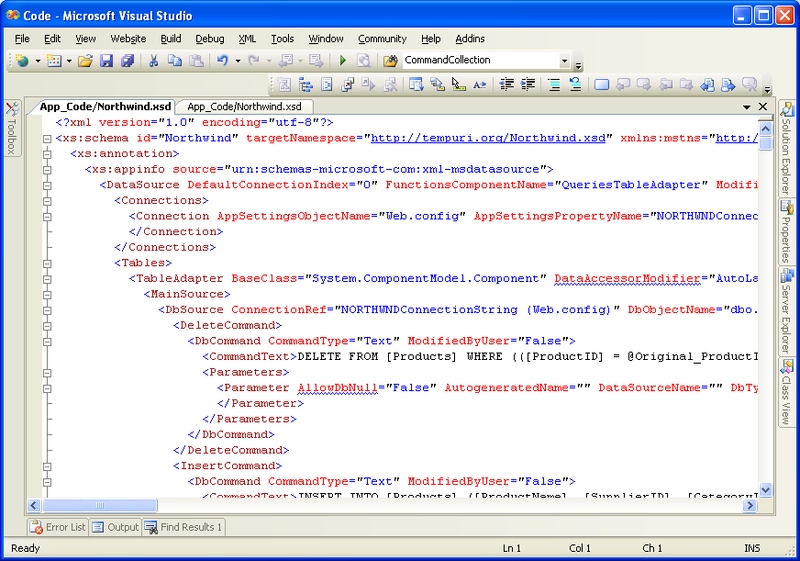 However, all of the tutorials will work equally well with the free version of Visual Studio 2005, Visual Web Developer. In this tutorial we'll start from the very beginning and create the Data Access Layer (DAL), followed by creating the Business Logic Layer (BLL) in the second tutorial, and working on page layout and navigation in the third. The tutorials after the third one will build upon the foundation laid in the first three. We've got a lot to cover in this first tutorial, so fire up Visual Studio and let's get started! Before we can create our Data Access Layer (DAL), we first need to create a web site and setup our database. Start by creating a new file system-based ASP.NET web site. To accomplish this, go to the File menu and choose New Web Site, displaying the New Web Site dialog box. 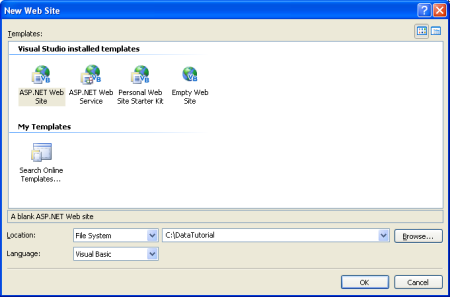 Choose the ASP.NET Web Site template, set the Location drop-down list to File System, choose a folder to place the web site, and set the language to Visual Basic. 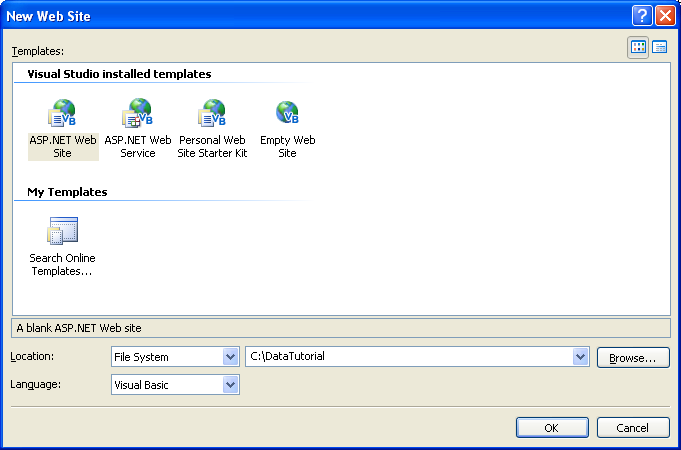 This will create a new web site with a Default.aspx ASP.NET page, an App_Data folder, and a Web.config file. With the web site created, the next step is to add a reference to the database in Visual Studio's Server Explorer. By adding a database to the Server Explorer you can add tables, stored procedures, views, and so on all from within Visual Studio. 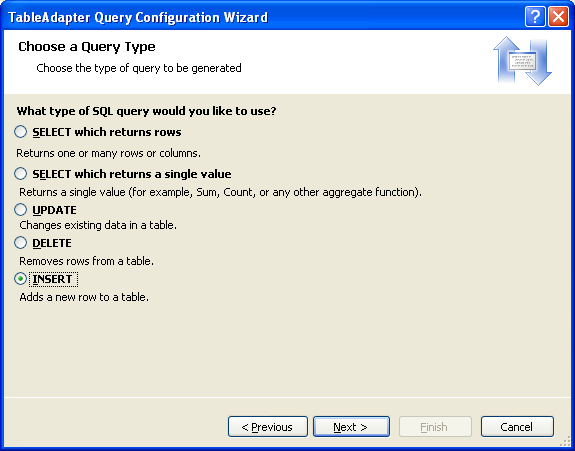 You can also view table data or create your own queries either by hand or graphically via the Query Builder. Furthermore, when we build the Typed DataSets for the DAL we'll need to point Visual Studio to the database from which the Typed DataSets should be constructed. While we can provide this connection information at that point in time, Visual Studio automatically populates a drop-down list of the databases already registered in the Server Explorer. The steps for adding the Northwind database to the Server Explorer depend on whether you want to use the SQL Server 2005 Express Edition database in the App_Data folder or if you have a Microsoft SQL Server 2000 or 2005 database server setup that you want to use instead. If you do not have a SQL Server 2000 or 2005 database server to connect to, or you simply want to avoid having to add the database to a database server, you can use the SQL Server 2005 Express Edition version of the Northwind database that is located in the downloaded website's App_Data folder (NORTHWND.MDF). 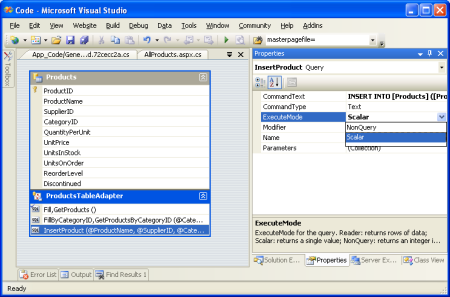 A database placed in the App_Data folder is automatically added to the Server Explorer. Assuming you have SQL Server 2005 Express Edition installed on your machine you should see a node named NORTHWND.MDF in the Server Explorer, which you can expand and explore its tables, views, stored procedure, and so on (see Figure 2). The App_Data folder can also hold Microsoft Access .mdb files, which, like their SQL Server counterparts, are automatically added to the Server Explorer. 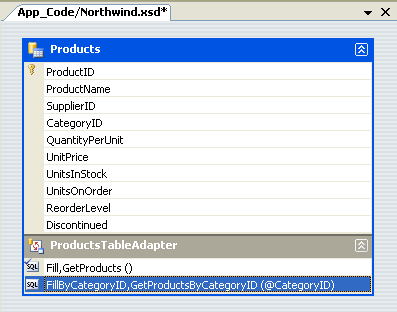 If you don't want to use any of the SQL Server options, you can always download a Microsoft Access version of the Northwind database file and drop into the App_Data directory. Keep in mind, however, that Access databases aren't as feature-rich as SQL Server, and aren't designed to be used in web site scenarios. Furthermore, a couple of the 35+ tutorials will utilize certain database-level features that aren't supported by Access. 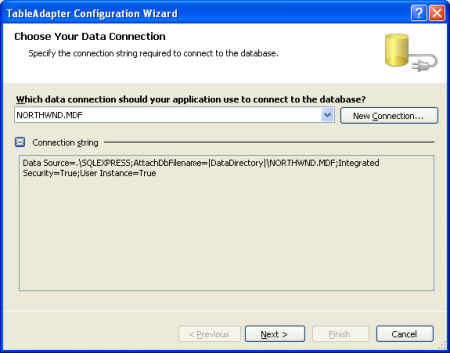 Alternatively, you may connect to a Northwind database installed on a database server. 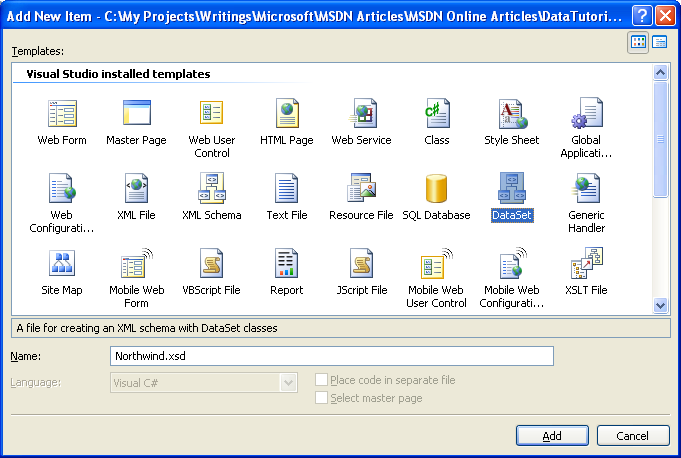 If the database server does not already have the Northwind database installed, you first must add it to database server by running the installation script included in this tutorial's download or by downloading the SQL Server 2000 version of Northwind and installation script directly from Microsoft's web site. Once you have the database installed, go to the Server Explorer in Visual Studio, right-click on the Data Connections node, and choose Add Connection. If you don't see the Server Explorer go to the View / Server Explorer, or hit Ctrl+Alt+S. This will bring up the Add Connection dialog box, where you can specify the server to connect to, the authentication information, and the database name. Once you have successfully configured the database connection information and clicked the OK button, the database will be added as a node underneath the Data Connections node. 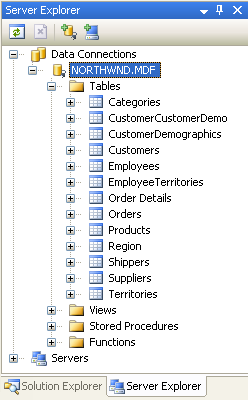 You can expand the database node to explore its tables, views, stored procedures, and so on. When working with data one option is to embed the data-specific logic directly into the presentation layer (in a web application, the ASP.NET pages make up the presentation layer). This may take the form of writing ADO.NET code in the ASP.NET page's code portion or using the SqlDataSource control from the markup portion. In either case, this approach tightly couples the data access logic with the presentation layer. The recommended approach, however, is to separate the data access logic from the presentation layer. This separate layer is referred to as the Data Access Layer, DAL for short, and is typically implemented as a separate Class Library project. The benefits of this layered architecture are well documented (see the "Further Readings" section at the end of this tutorial for information on these advantages) and is the approach we will take in this series. These methods, when invoked, will connect to the database, issue the appropriate query, and return the results. How we return these results is important. These methods could simply return a DataSet or DataReader populated by the database query, but ideally these results should be returned using strongly-typed objects. A strongly-typed object is one whose schema is rigidly defined at compile time, whereas the opposite, a loosely-typed object, is one whose schema is not known until runtime. 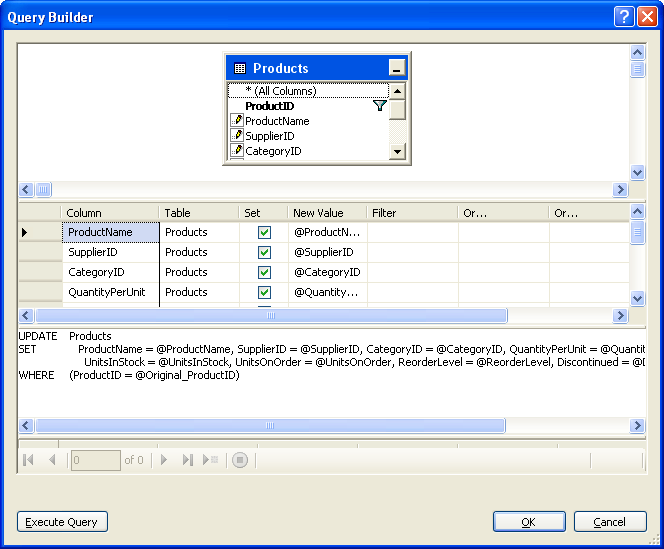 For example, the DataReader and the DataSet (by default) are loosely-typed objects since their schema is defined by the columns returned by the database query used to populate them. To access a particular column from a loosely-typed DataTable we need to use syntax like: DataTable.Rows(index)("columnName"). 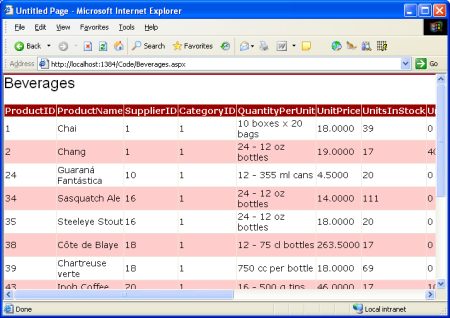 The DataTable's loose typing in this example is exhibited by the fact that we need to access the column name using a string or ordinal index. A strongly-typed DataTable, on the other hand, will have each of its columns implemented as properties, resulting in code that looks like: DataTable.Rows(index).columnName. To return strongly-typed objects, developers can either create their own custom business objects or use Typed DataSets. A business object is implemented by the developer as a class whose properties typically reflect the columns of the underlying database table the business object represents. A Typed DataSet is a class generated for you by Visual Studio based on a database schema and whose members are strongly-typed according to this schema. The Typed DataSet itself consists of classes that extend the ADO.NET DataSet, DataTable, and DataRow classes. In addition to strongly-typed DataTables, Typed DataSets now also include TableAdapters, which are classes with methods for populating the DataSet's DataTables and propagating modifications within the DataTables back to the database. For more information on the advantages and disadvantages of using Typed DataSets versus custom business objects, refer to Designing Data Tier Components and Passing Data Through Tiers. We'll use strongly-typed DataSets for these tutorials' architecture. Figure 3 illustrates the workflow between the different layers of an application that uses Typed DataSets. To begin creating our DAL, we start by adding a Typed DataSet to our project. To accomplish this, right-click on the project node in the Solution Explorer and choose Add a New Item. 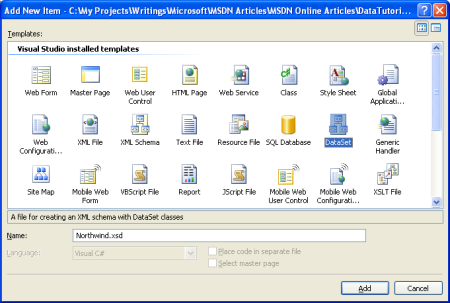 Select the DataSet option from the list of templates and name it Northwind.xsd. After clicking Add, when prompted to add the DataSet to the App_Code folder, choose Yes. The Designer for the Typed DataSet will then be displayed, and the TableAdapter Configuration Wizard will start, allowing you to add your first TableAdapter to the Typed DataSet. A Typed DataSet serves as a strongly-typed collection of data; it is composed of strongly-typed DataTable instances, each of which is in turn composed of strongly-typed DataRow instances. We will create a strongly-typed DataTable for each of the underlying database tables that we need to work with in this tutorials series. 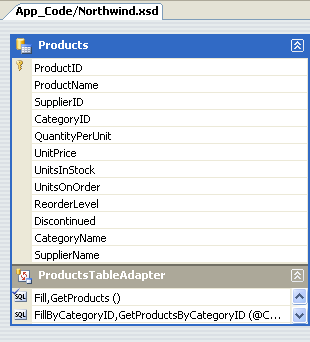 Let's start with creating a DataTable for the Products table. Keep in mind that strongly-typed DataTables do not include any information on how to access data from their underlying database table. In order to retrieve the data to populate the DataTable, we use a TableAdapter class, which functions as our Data Access Layer. For our Products DataTable, the TableAdapter will contain the methods GetProducts(), GetProductByCategoryID(categoryID), and so on that we'll invoke from the presentation layer. The DataTable's role is to serve as the strongly-typed objects used to pass data between the layers. 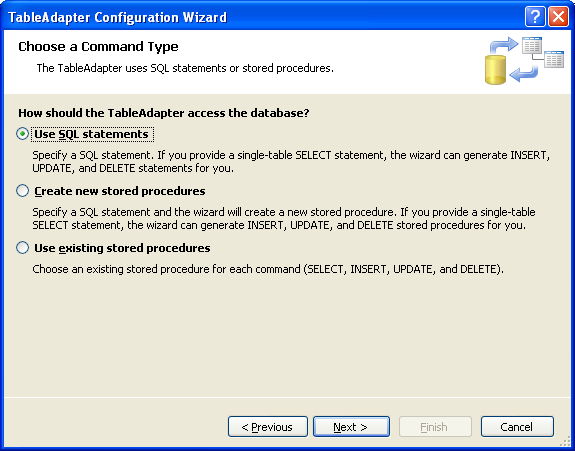 The TableAdapter Configuration Wizard begins by prompting you to select which database to work with. The drop-down list shows those databases in the Server Explorer. If you did not add the Northwind database to the Server Explorer, you can click the New Connection button at this time to do so. After selecting the database and clicking Next, you'll be asked if you want to save the connection string in the Web.config file. By saving the connection string you'll avoid having it hard coded in the TableAdapter classes, which simplifies things if the connection string information changes in the future. If you opt to save the connection string in the configuration file it's placed in the <connectionStrings> section, which can be optionally encrypted for improved security or modified later through the new ASP.NET 2.0 Property Page within the IIS GUI Admin Tool, which is more ideal for administrators. Next, we need to define the schema for the first strongly-typed DataTable and provide the first method for our TableAdapter to use when populating the strongly-typed DataSet. These two steps are accomplished simultaneously by creating a query that returns the columns from the table that we want reflected in our DataTable. 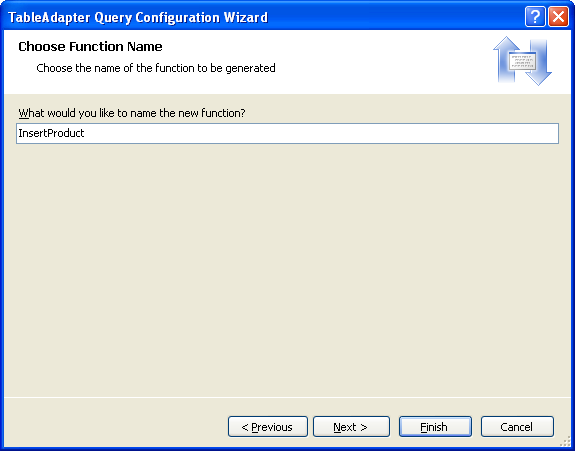 At the end of the wizard we'll give a method name to this query. Once that's been accomplished, this method can be invoked from our presentation layer. The method will execute the defined query and populate a strongly-typed DataTable. To get started defining the SQL query we must first indicate how we want the TableAdapter to issue the query. We can use an ad-hoc SQL statement, create a new stored procedure, or use an existing stored procedure. For these tutorials we'll use ad-hoc SQL statements. 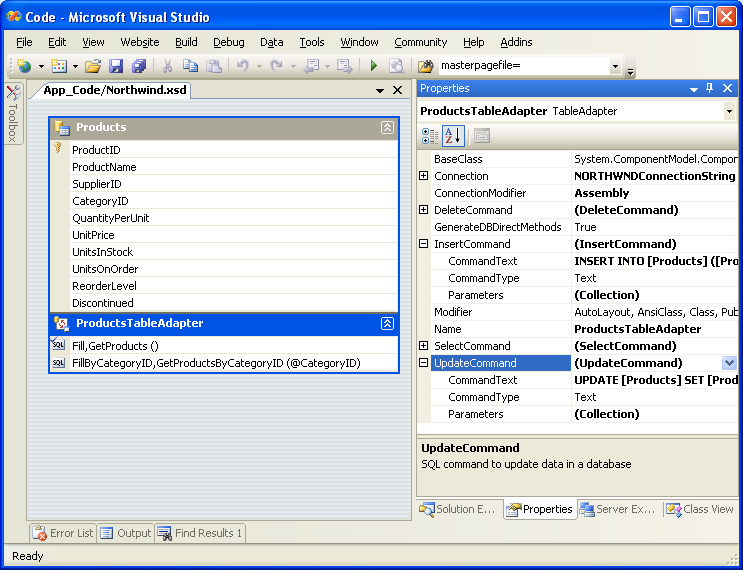 Refer to Brian Noyes's article, Build a Data Access Layer with the Visual Studio 2005 DataSet Designer for an example of using stored procedures. Alternatively, use the Query Builder and graphically construct the query, as shown in Figure 9. After creating the query, but before moving onto the next screen, click the Advanced Options button. 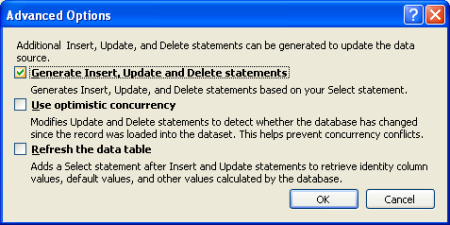 In Web Site Projects, "Generate Insert, Update, and Delete statements" is the only advanced option selected by default; if you run this wizard from a Class Library or a Windows Project the "Use optimistic concurrency" option will also be selected. Leave the "Use optimistic concurrency" option unchecked for now. We'll examine optimistic concurrency in future tutorials. 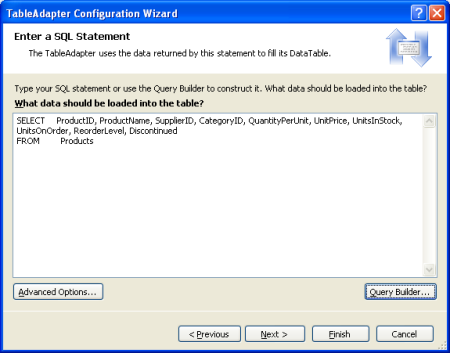 Fill a DataTable with this approach a method is created that takes in a DataTable as a parameter and populates it based on the results of the query. 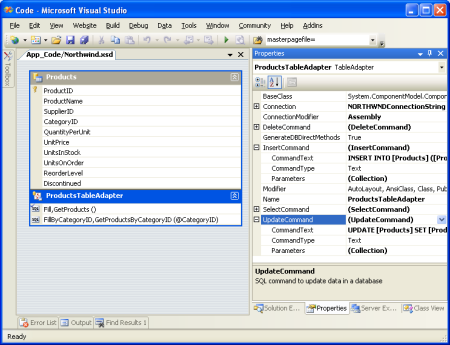 The ADO.NET DataAdapter class, for example, implements this pattern with its Fill() method. Return a DataTable with this approach the method creates and fills the DataTable for you and returns it as the methods return value. You can have the TableAdapter implement one or both of these patterns. You can also rename the methods provided here. Let's leave both checkboxes checked, even though we'll only be using the latter pattern throughout these tutorials. Also, let's rename the rather generic GetData method to GetProducts. If checked, the final checkbox, "GenerateDBDirectMethods," creates Insert(), Update(), and Delete() methods for the TableAdapter. If you leave this option unchecked, all updates will need to be done through the TableAdapter's sole Update() method, which takes in the Typed DataSet, a DataTable, a single DataRow, or an array of DataRows. (If you've unchecked the "Generate Insert, Update, and Delete statements" option from the advanced properties in Figure 9 this checkbox's setting will have no effect.) Let's leave this checkbox selected. Complete the wizard by clicking Finish. After the wizard closes we are returned to the DataSet Designer which shows the DataTable we just created. You can see the list of columns in the Products DataTable (ProductID, ProductName, and so on), as well as the methods of the ProductsTableAdapter (Fill() and GetProducts()). This code did not require us to write one bit of data access-specific code. We did not have to instantiate any ADO.NET classes, we didn't have to refer to any connection strings, SQL queries, or stored procedures. Instead, the TableAdapter provides the low-level data access code for us. Each object used in this example is also strongly-typed, allowing Visual Studio to provide IntelliSense and compile-time type checking. 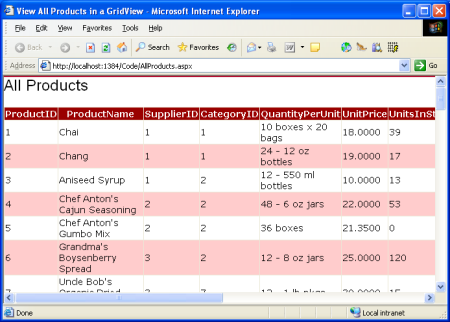 And best of all the DataTables returned by the TableAdapter can be bound to ASP.NET data Web controls, such as the GridView, DetailsView, DropDownList, CheckBoxList, and several others. The following example illustrates binding the DataTable returned by the GetProducts() method to a GridView in just a scant three lines of code within the Page_Load event handler. <%@ Page Language="VB" AutoEventWireup="true" CodeFile="AllProducts.aspx.vb"
While this example required that we write three lines of code in our ASP.NET page's Page_Load event handler, in future tutorials we'll examine how to use the ObjectDataSource to declaratively retrieve the data from the DAL. With the ObjectDataSource we'll not have to write any code and will get paging and sorting support as well! At this point our ProductsTableAdapter class has but one method, GetProducts(), which returns all of the products in the database. While being able to work with all products is definitely useful, there are times when we'll want to retrieve information about a specific product, or all products that belong to a particular category. To add such functionality to our Data Access Layer we can add parameterized methods to the TableAdapter. Let's add the GetProductsByCategoryID(categoryID) method. 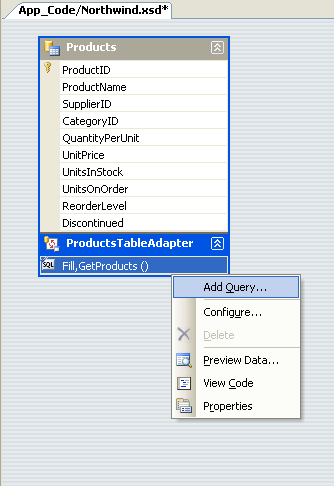 To add a new method to the DAL, return to the DataSet Designer, right-click in the ProductsTableAdapter section, and choose Add Query. We are first prompted about whether we want to access the database using an ad-hoc SQL statement or a new or existing stored procedure. Let's choose to use an ad-hoc SQL statement again. 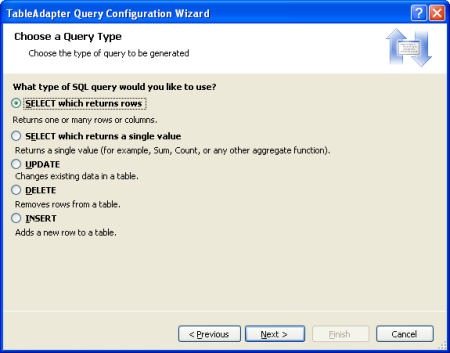 Next, we are asked what type of SQL query we'd like to use. Since we want to return all products that belong to a specified category, we want to write a SELECT statement which returns rows. 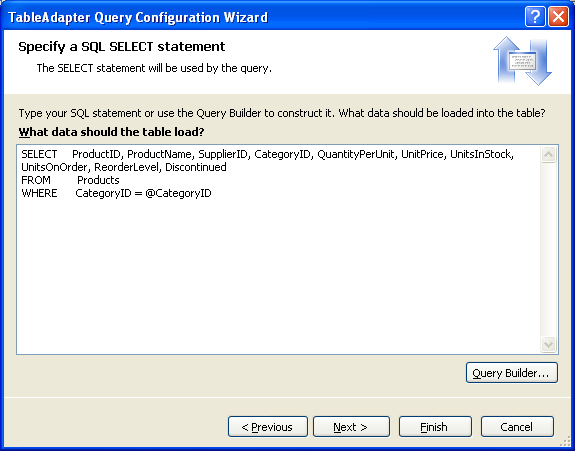 The next step is to define the SQL query used to access the data. Since we want to return only those products that belong to a particular category, I use the same SELECT statement from GetProducts(), but add the following WHERE clause: WHERE CategoryID = @CategoryID. The @CategoryID parameter indicates to the TableAdapter wizard that the method we're creating will require an input parameter of the corresponding type (namely, a nullable integer). In the final step we can choose which data access patterns to use, as well as customize the names of the methods generated. For the Fill pattern, let's change the name to FillByCategoryID and for the return a DataTable return pattern (the GetX methods), let's use GetProductsByCategoryID. After completing the wizard, the DataSet Designer includes the new TableAdapter methods. Take a moment to add a GetProductByProductID(productID) method using the same technique. 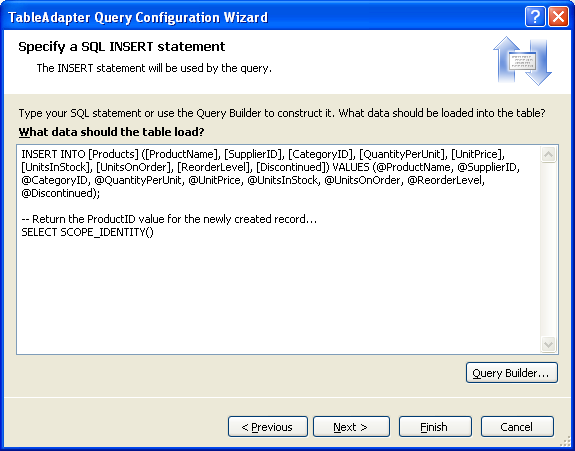 These parameterized queries can be tested directly from the DataSet Designer. 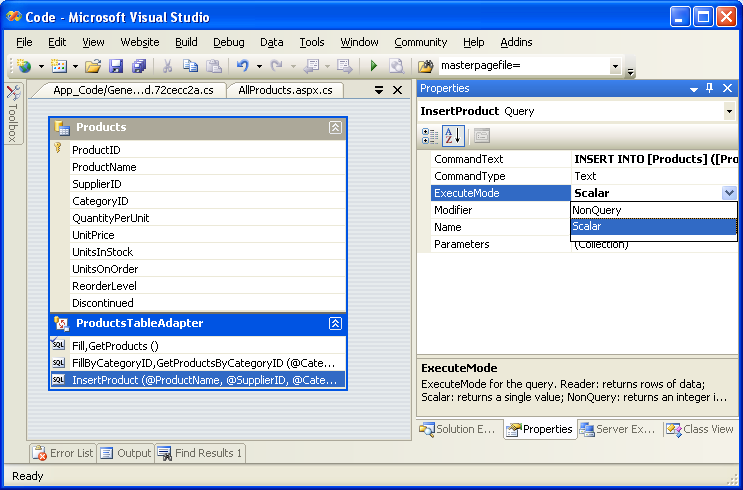 Right-click on the method in the TableAdapter and choose Preview Data. Next, enter the values to use for the parameters and click Preview. 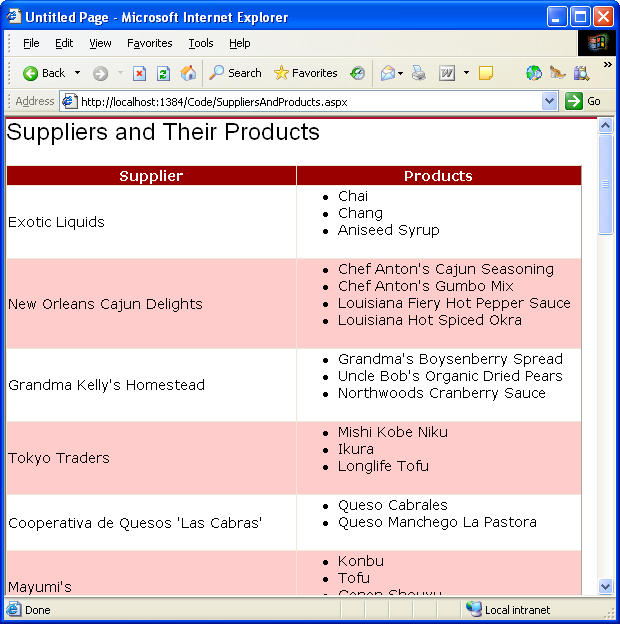 With the GetProductsByCategoryID(categoryID) method in our DAL, we can now create an ASP.NET page that displays only those products in a specified category. 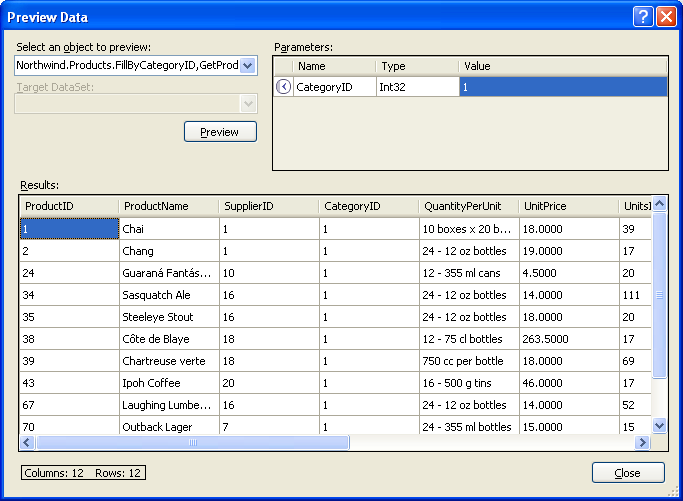 The following example shows all products that are in the Beverages category, which have a CategoryID of 1. <%@ Page Language="VB" AutoEventWireup="true" CodeFile="Beverages.aspx.vb"
There are two patterns commonly used for inserting, updating, and deleting data. The first pattern, which I'll call the database direct pattern, involves creating methods that, when invoked, issue an INSERT, UPDATE, or DELETE command to the database that operates on a single database record. Such methods are typically passed in a series of scalar values (integers, strings, Booleans, DateTimes, and so on) that correspond to the values to insert, update, or delete. For example, with this pattern for the Products table the delete method would take in an integer parameter, indicating the ProductID of the record to delete, while the insert method would take in a string for the ProductName, a decimal for the UnitPrice, an integer for the UnitsOnStock, and so on. The other pattern, which I'll refer to as the batch update pattern, is to update an entire DataSet, DataTable, or collection of DataRows in one method call. With this pattern a developer deletes, inserts, and modifies the DataRows in a DataTable and then passes those DataRows or DataTable into an update method. This method then enumerates the DataRows passed in, determines whether or not they've been modified, added, or deleted (via the DataRow's RowState property value), and issues the appropriate database request for each record. 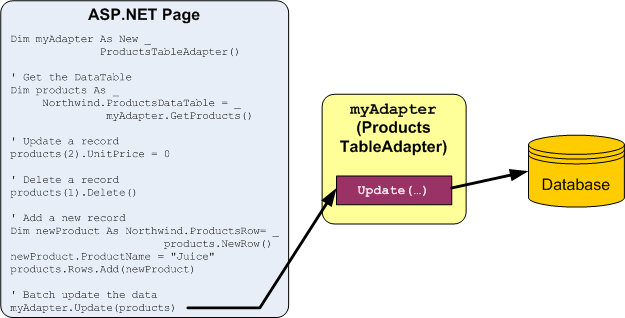 The TableAdapter uses the batch update pattern by default, but also supports the DB direct pattern. Since we selected the "Generate Insert, Update, and Delete statements" option from the Advanced Properties when creating our TableAdapter, the ProductsTableAdapter contains an Update() method, which implements the batch update pattern. Specifically, the TableAdapter contains an Update() method that can be passed the Typed DataSet, a strongly-typed DataTable, or one or more DataRows. 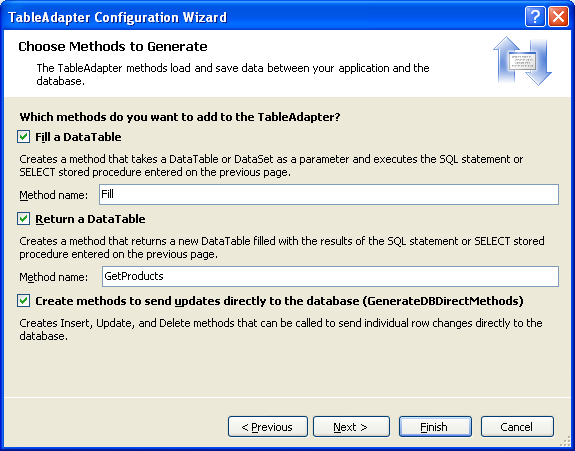 If you left the "GenerateDBDirectMethods" checkbox checked when first creating the TableAdapter the DB direct pattern will also be implemented via Insert(), Update(), and Delete() methods. To examine or modify any of these database command properties, click on the CommandText subproperty, which will bring up the Query Builder. The Insert(), Update(), and Delete() methods created by the DB direct method can be a bit cumbersome, especially for tables with many columns. Looking at the previous code example, without IntelliSense's help it's not particularly clear what Products table column maps to each input parameter to the Update() and Insert() methods. There may be times when we only want to update a single column or two, or want a customized Insert() method that will, perhaps, return the value of the newly inserted record's IDENTITY (auto-increment) field. To create such a custom method, return to the DataSet Designer. 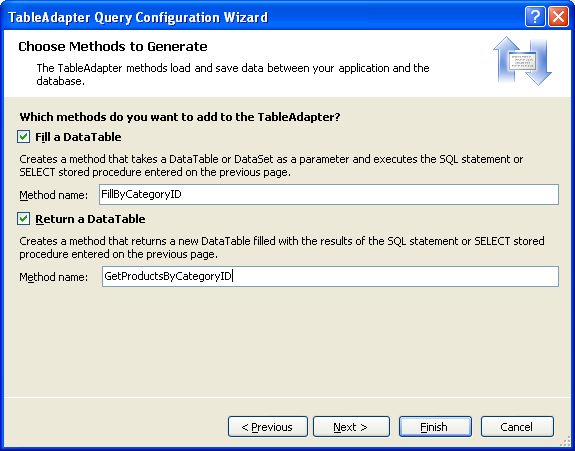 Right-click on the TableAdapter and choose Add Query, returning to the TableAdapter wizard. On the second screen we can indicate the type of query to create. Let's create a method that adds a new product and then returns the value of the newly added record's ProductID. 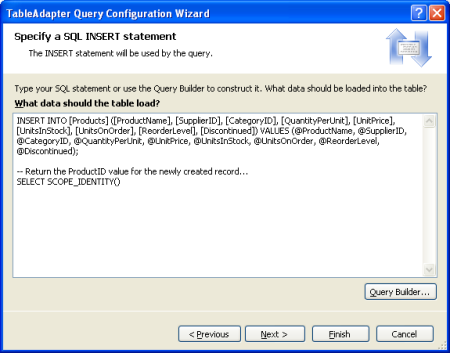 Therefore, opt to create an INSERT query. On the next screen the InsertCommand's CommandText appears. Augment this query by adding SELECT SCOPE_IDENTITY() at the end of the query, which will return the last identity value inserted into an IDENTITY column in the same scope. (See the technical documentation for more information about SCOPE_IDENTITY() and why you probably want to use SCOPE_IDENTITY() in lieu of @@IDENTITY.) Make sure that you end the INSERT statement with a semi-colon before adding the SELECT statement. Finally, name the new method InsertProduct. When you return to the DataSet Designer you'll see that the ProductsTableAdapter contains a new method, InsertProduct. If this new method doesn't have a parameter for each column in the Products table, chances are you forgot to terminate the INSERT statement with a semi-colon. Configure the InsertProduct method and ensure you have a semi-colon delimiting the INSERT and SELECT statements. By default, insert methods issue non-query methods, meaning that they return the number of affected rows. 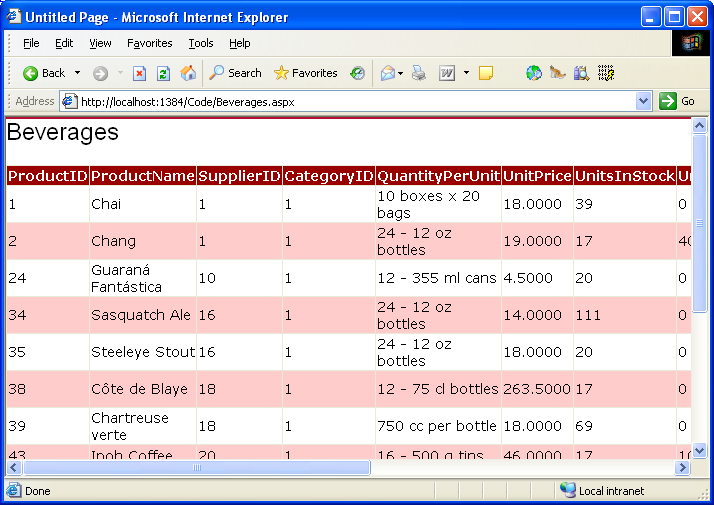 However, we want the InsertProduct method to return the value returned by the query, not the number of rows affected. 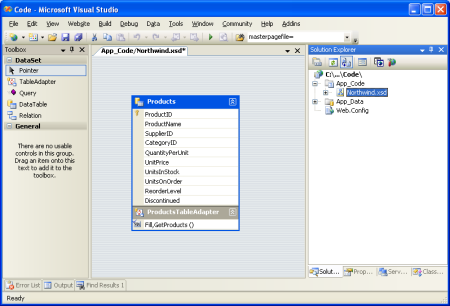 To accomplish this, adjust the InsertProduct method's ExecuteMode property to Scalar. 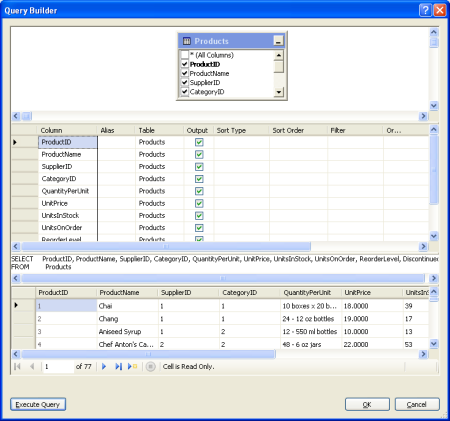 Note that the ProductsTableAdapters class returns the CategoryID and SupplierID values from the Products table, but doesn't include the CategoryName column from the Categories table or the CompanyName column from the Suppliers table, although these are likely the columns we want to display when showing product information. We can augment the TableAdapter's initial method, GetProducts(), to include both the CategoryName and CompanyName column values, which will update the strongly-typed DataTable to include these new columns as well. After updating the GetProducts() method to use this new query the DataTable will include two new columns: CategoryName and SupplierName. Take a moment to update the SELECT clause in the GetProductsByCategoryID(categoryID) method as well. If you update the GetProducts() SELECT using JOIN syntax the DataSet Designer won't be able to auto-generate the methods for inserting, updating, and deleting database data using the DB direct pattern. Instead, you'll have to manually create them much like we did with the InsertProduct method earlier in this tutorial. Furthermore, you'll manually have to provide the InsertCommand, UpdateCommand, and DeleteCommand property values if you want to use the batch updating pattern. Up until now, we've only looked at working with a single TableAdapter for a single database table. However, the Northwind database contains several related tables that we'll need to work with in our web application. 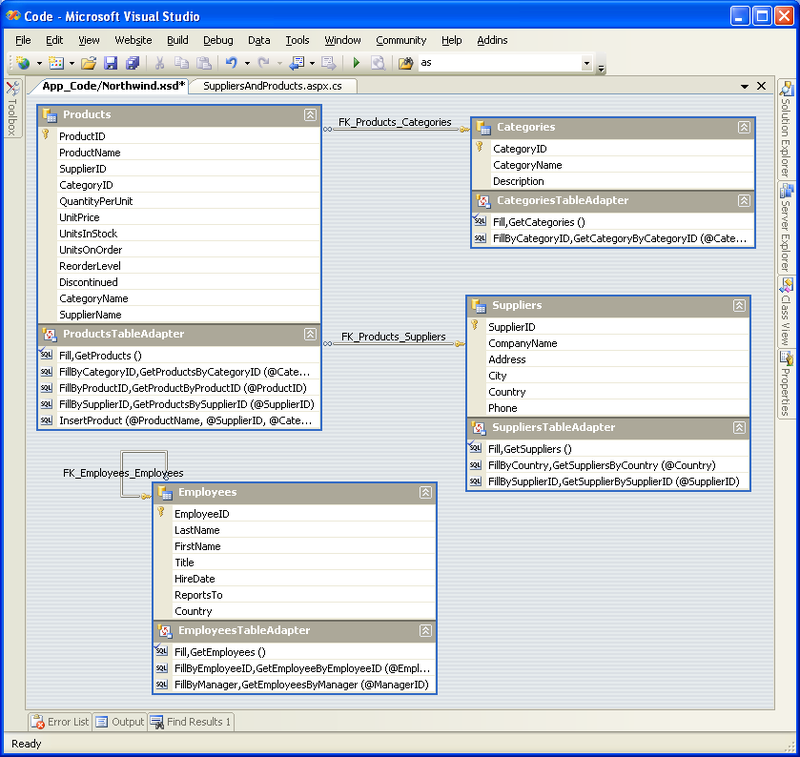 A Typed DataSet can contain multiple, related DataTables. Therefore, to complete our DAL we need to add DataTables for the other tables we'll be using in these tutorials. To add a new TableAdapter to a Typed DataSet, open the DataSet Designer, right-click in the Designer, and choose Add / TableAdapter. 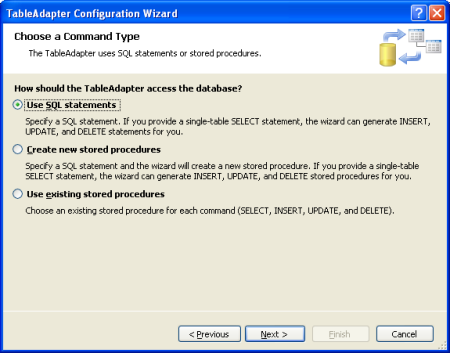 This will create a new DataTable and TableAdapter and walk you through the wizard we examined earlier in this tutorial. Take a few minutes to create the following TableAdapters and methods using the following queries. 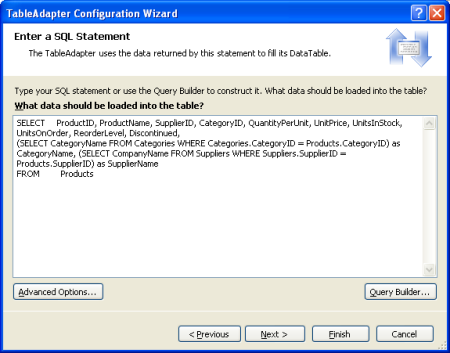 Note that the queries in the ProductsTableAdapter include the subqueries to grab each product's category and supplier names. Additionally, if you've been following along, you've already added the ProductsTableAdapter class's GetProducts() and GetProductsByCategoryID(categoryID) methods. 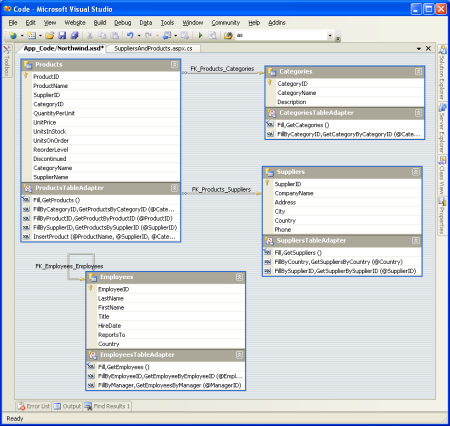 The TableAdapters and DataTables added to the Typed DataSet are expressed as an XML Schema Definition file (Northwind.xsd). You can view this schema information by right-clicking on the Northwind.xsd file in the Solution Explorer and choosing View Code. This schema information is translated into C# or Visual Basic code at design time when compiled or at runtime (if needed), at which point you can step through it with the debugger. To view this auto-generated code go to the Class View and drill down to the TableAdapter or Typed DataSet classes. If you don't see the Class View on your screen, go to the View menu and select it from there, or hit Ctrl+Shift+C. From the Class View you can see the properties, methods, and events of the Typed DataSet and TableAdapter classes. To view the code for a particular method, double-click the method name in the Class View or right-click on it and choose Go To Definition. While auto-generated code can be a great time saver, the code is often very generic and needs to be customized to meet the unique needs of an application. The risk of extending auto-generated code, though, is that the tool that generated the code might decide it's time to "regenerate" and overwrite your customizations. With .NET 2.0's new partial class concept, it's easy to split a class across multiple files. This enables us to add our own methods, properties, and events to the auto-generated classes without having to worry about Visual Studio overwriting our customizations. This partial class instructs the compiler that when building the Northwind.SuppliersRow class to include the GetProducts() method we just defined. 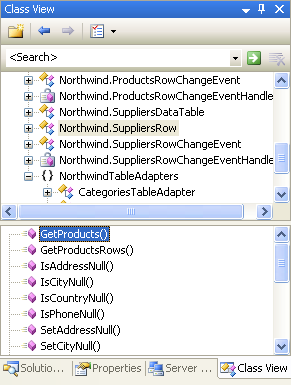 If you build your project and then return to the Class View you'll see GetProducts() now listed as a method of Northwind.SuppliersRow. A TemplateField that contains a BulletedList control that is bound to the results returned by the GetProducts() method for each supplier. We'll examine how to display such master-detail reports in future tutorials. For now, this example is designed to illustrate using the custom method added to the Northwind.SuppliersRow class. runat="server" DataSource="<%# CType(CType(Container.DataItem, System.Data.DataRowView).Row, Northwind.SuppliersRow).GetProducts() %>"
When building a web application creating the DAL should be one of your first steps, occurring before you start creating your presentation layer. 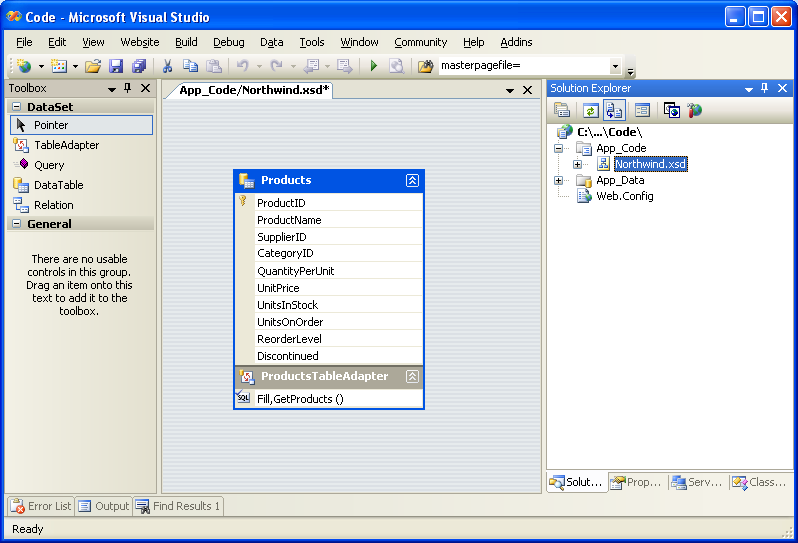 With Visual Studio, creating a DAL based on Typed DataSets is a task that can be accomplished in 10-15 minutes without writing a line of code. The tutorials moving forward will build upon this DAL. In the next tutorial we'll define a number of business rules and see how to implement them in a separate Business Logic Layer. This tutorial series was reviewed by many helpful reviewers. Lead reviewers for this tutorial were Ron Green, Hilton Giesenow, Dennis Patterson, Liz Shulok, Abel Gomez, and Carlos Santos. Interested in reviewing my upcoming MSDN articles? If so, drop me a line at mitchell@4GuysFromRolla.com.